Sri Lanka has got its smile back. This serendipitous isle, blighted by 25 years of civil war and, exactly a decade ago, a devastating tsunami, is finally emerging from the darkness of its recent past to brighten visitors’ lives with smart new hotels and modern infrastructure to enhance its superb natural attractions. There is free Wi-Fi on the jerky but spectacular train journey from Colombo to Kandy (a cut above what GWR or Virgin offer). There is better mobile reception in the sparsely populated hill country than in Shepherd’s Bush. Even the once-ravaged east coast is open for business. 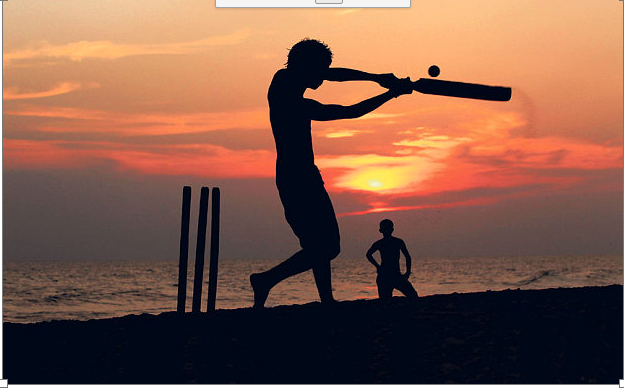 Cricket, a game at which Sri Lanka excels, has helped to unite this troubled country. Ignoring race and religion, its star players and their international counterparts such as Sir Ian Botham have been at the forefront of its rejuvenation. It is now as rewarding to visit as its brilliant players are to watch. I was standing atop the landmark Dutch Fort in Galle last Sunday among Japanese tourists posing for selfies, English honeymooners basking in the sun and a couple of snake charmers with a monkey on a lead. It was here where, 10 years ago on Boxing Day 2004, catastrophe struck. A former Harrow pupil, Spencer Crawley, on a cricket tour to Sri Lanka with the school at the time, remembers it vividly. “We were warming up on the Galle outfield. Suddenly from nowhere this sheet of water raced across the field. It was as if a pipe had burst. The immediate reaction was to head for the pavilion as it was built on stilts. “Just as we got there a second layer of water, much bigger and stronger, surged across from either side of the fort. It was like a pincer movement. “Two powerful walls of turbulent water and within about 30 seconds the whole ground was engulfed. The school bus in the car park had been thrown towards the pavilion and then flung to the other side of the ground.” The water kept rising to the top of the pavilion steps and several times they were told to get ready to swim. After three frightening hours, the water receded and they were able to escape to the safety of the fort, passing the bodies of two spectators who hadn’t made it to the pavilion in time. Galle’s main street was littered with bodies and overturned vehicles. Spencer’s mother and stepfather were travelling to the game in a bus when the tsunami struck. The bus overturned. Spencer’s stepfather Julian forced out the back window of the bus and helped his wife escape though he himself perished. The family subsequently donated money to the establishment of a cricket academy at the rebuilt Galle stadium that was named after him. That generosity was typical of the cricketing fraternity’s response to the disaster that claimed the lives of 30,000 people in Sri Lanka, including hundreds of holidaymakers. The legendary spinner Muttiah Muralitharan, who but for the warnings from other motorists could have been a tsunami victim himself, immediately began major fundraising with the Foundation of Goodness, the charity he set up with his manager Kushil Gunasekera. Murali, a Tamil, seconded the rest of the Sri Lanka team – mostly Sinhalese – to help. They rode relief trucks to the devastated east coast to usurp obstructive red tape. Gunasekera personally rescued dozens of children in his home village of Seenigama, which was destroyed. He set about establishing a modern settlement and sports academy on the site and it now boasts 1,000 houses, an IT training centre and two artificial cricket pitches laid by the MCC and Surrey called Lord’s and The Oval. Botham, profoundly affected by a tsunami survivor he had met who couldn’t save both her children from the advancing sea and had to let one go, threw himself into the fundraising initiative and recently walked from one end of Sri Lanka to the other for the cause. Not long after the tsunami struck, the fragile truce between the Sinhalese government and the Tamil rebels broke down and fighting intensified again. The war was brutally ended only in 2009. Since then the country has slowly but determinedly struggled to its feet. In the 30 years that I have been coming here, drawn by the beauty of the place and its people as well as its uninhibited cricketers, this is the first time I have seen the green shoots of peace and prosperity finally sprouting. At last you can have a fabulous, diverse, safe (and relatively cheap) holiday in Sri Lanka. It has everything that India has – and more – without the crowds or the hassle. Colombo, wracked with tension and hamstrung by road blocks and security checks just five years ago, is now a buzzing and thriving metropolis. New motorways built with cheap Chinese loans whisk visitors from the airport to the centre in 30 minutes and down to the glimmering south coast resorts in an hour and a half. Boutique hotels and cool restaurants have sprung up. At the Ministry of Crab, owned by star batsman Kumar Sangakkara, you eat chunky crustaceans (he prefers you do it with your hands) in spicy sauces in the relaxed ambience of the converted Dutch Hospital. There are other eateries and shops and a bar with live music next door. Namo Gama – a reconstruction of a traditional Sri Lankan village – is hidden at the back of the plush Cinnamon Grand hotel. It is where you will find Sri Lanka’s best dish – seer fish curry, a white fish the texture of tuna in a wonderful aromatic sauce of spices, curry leaves and coconut milk. It is totally addictive. Don’t hang about long in Colombo, there’s so much else to see: ancient Buddhist sites such as the one at Anuradhapura, tea-trails in the verdant hills, safari parks and idyllic beaches. Spend as much time as you can on the south coast. The old streets of Galle Fort are fun to browse for clothes, home wares and gems – blue sapphires the speciality – but visit a few and compare prices. Have a drink in the colonial Galle Fort hotel or the Amangalla, but don’t bother with Mama’s rooftop Fort café – I’ve had better school dinners. The coast south of Galle is lush, undulating and beautiful. It’s like South Devon in the tropics. It has the sunniest climate in Sri Lanka. The winding coast road is dotted with little beach hotels. Avoid Unawatuna – it’s way too developed and tacky – and anything that calls itself a “resort”. Try instead the quiet, airy Frangipane Tree (Thalpe) with a pleasant garden and private beach, or the more swanky Fortress Hotel and Spa (Koggala), which looks like a prison from the outside. Inside are expansive, superbly equipped rooms with gigantic beds overlooking the sea and the longest infinity pool in the world. Have late lunch at the cute, simple Wijaya beach – easy to miss on the main road close to Unawatuna – which has trees growing through its roof, overlooks a gorgeous little cove with its own tranquil lagoon and does a delicious tuna sashimi. Surf dudes ride the waves beyond a small reef as the sun sets. It’s the beach café Ibiza can only dream of. And then, a bit further down past all the little colourful stores and the fishermen on stilts and the cows in the road, is the pièce de résistance. On a headland hidden from the main road is Cape Weligama. This is Sri Lanka’s first super luxury hotel. It symbolises the country’s emergence as an upmarket destination. There are no hotel “rooms” here. Set into the hillside are 40 villas of varying sizes – with large verandas, some with their own pool – creating the feel of an exclusive private home. You even have your own butler. The wooden-shuttered bedrooms are huge, with the largest and most comfortable beds I have ever slept in. The marble and granite bathrooms are the size of small chapels and have heated floors and your own massage couch. The food in the Thai-designed open-air restaurant is to die for – the outside tables overlooking a sequence of glittering bays – and the crescent-shaped infinity pool at the tip of the headland seems to be magically suspended over the sea. There are no prices or bills – everything is included (at a cost, of course) – and they will organise private whale-watching, diving, snorkelling or boat trips. In fact, they will do anything you desire. It was hard to leave. I drove farther around the coast to Yala National Park. There are two new hotels on the coast close to the entrance. The Laya with large, Hof-House-style rooms is decent, but the Jetwing next door is bigger and better. In a two-hour drive in an open-sided Jeep, we saw elephants, crocodiles, buffalo, monitor lizards, numerous tropical birds and, the highlight, a leopard hanging casually in a tree 30 yards away, and then leaping down. But, obliged to stick to the few roads there are and jockeying for vantage points, often with 10 other vehicles, it did feel like being in a theme park. It doesn’t compare with an African safari. During the course of my stay, I also ventured to Batticaloa and Trincomalee – former frontier towns on the east coast only recently open to tourism. There is nothing much to see in Batti, just a dilapidated Dutch Fort, and the beaches in the area aren’t great. Trinco, 75 miles farther north, is more interesting and there are cheap daily flights from Colombo. At Nilaveli, 20 minutes out of town, the beach at the Anilana hotel is fine (and the food is outstanding). From there a 10-minute boat ride takes you to Pigeon island to dive or snorkel on the reef. I saw large turtles, metre-long reef sharks (vegetarian, apparently!) and plenty of Nemos and Dorys. But much of the coral hasn’t yet recovered from the tsunami. Thankfully, the people have. They cannot do enough for you. Nothing is too much trouble. There are still tourism teething troubles but everyone smiles in Sri Lanka, whether they’re Sinhalese, Tamil, Muslim or Christian. Well, of course they do. They’ve just beaten England at cricket. Again.